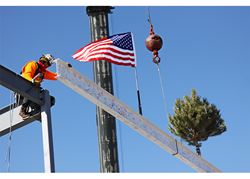 The topping out ceremony for the new Wiggins Middle and High School was a big event for a small town. The school community came together to celebrate the half-way mark of construction for their new school. The topping out ceremony for the new Wiggins Middle and High School was a big event for a small town. The school community came together to celebrate the half-way mark of construction for a new school that will be energy-efficient, code-compliant, safer and more educationally suitable for the Wiggins students and staff. Wiggins School District RE-50J worked with architect Hord Coplan Macht on analyzing their current buildings and systems and found the best value to reach their future educational goals would be to build a new addition. The 56,450-sf expansion will provide a new middle and high school for the community. The project includes minor renovations to the elementary school and existing weight room, as well as the events center since the new addition will connect to the existing events center. Project highlights include an expanded parking area, a 250-seat auxiliary gym, a wrestling room, an agriculture education shop, a 350-seat theater and 18 new classrooms. Students and staff signed their names on one of the steel beams before it was lifted and placed at the top of the structure. The event brought the community together to have an active and safe part in the construction of the voter-approved project. The project is set to complete in December 2018.